The rolling hills and flowing vineyards of Napa Valley are truly a one of a kind experience within the Northern California region. Home to some of the most well-known wineries worldwide, Napa Valley is a must-see destination for wine lovers and connoisseurs alike. However, getting there via airplane is less than convenient. Especially if you fly domestic. Before you plan your next trip consider flying private jet charter with Pacific Coast Jet. Our Napa private jet charter will take you to the heart of the Wine Country by dropping you off at the Sonoma County Airport. Rather than fly into a nearby city and commute in, experience the luxury and convenience of landing right where you want to be. There’s truly a little bit of something for everyone in Napa. From outdoor activities, to art exhibits and an exquisite culinary and nightlife scene you’ll surely enjoy all that the region has to offer. Click here for a full list of things to do in Napa. 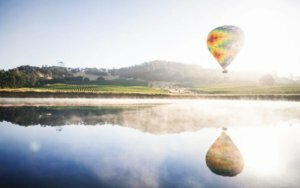 Are you ready to book your next trip to Napa Valley, California? Skip the crowds of the airport and the extra time in the car commuting and fly private jet charter. Our Napa private jet charter experts would love to help make your next trip to Napa the most relaxing one yet. Contact us today for rates and flight details.